It's HERE!!! Another edition of "Owning It...Claiming the Crazy"!! This month I want to introduce you to another real-life friend, Kelly. 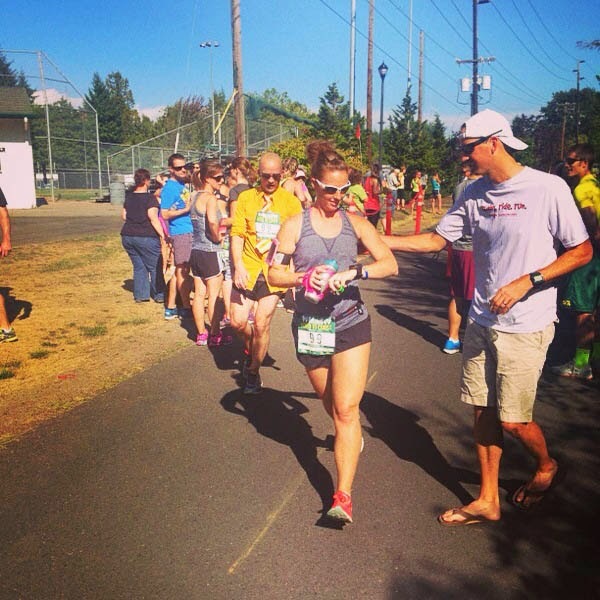 Kelly goes to my church and has a super fun running blog, Redhead on the Run. Seriously...I'm not a runner, but after I read her posts I THINK about lacing up my running shoes. Then I remember how TIRED I get when I run, so I decide to stay put. haha! :) She's on her way to becoming a personal trainer, so even if you don't run...she gives lots of great workout tips/ideas. She's also a wife and mommy to three kiddos. I LOVE hearing her talk about her life! She's so funny and she's always keepin' it real! You'll love her too! Check out her blog HERE. 2. I bite my nails. I know, its disgusting. I was born in 1981 for crying out loud. I'm old enough to know this is unacceptable. I have always wanted to be the girl with the well manicured nails. I have short nail beds ok? Even when my nails grow out, they don't look good. So, I fake nail(NexGen baby) these puppies and call it a day. 3. I cry in the shower. This post is about owning it right? For some reason the shower just seems to be the best place for a good cry. I'm alone, it's loud so no one can hear me, and it washes the ugly cry off my face so it doesn't crust. Just sayin. I can't be alone on this one. I have 3 kids. Finding quiet space to just let it all out is nearly impossible in my house. So, the shower it is. 4. I smell my laundry when I fold it. I know I'm probably losing you with each passing confession. Have you ever watched Everybody Loves Raymond? You know how Robert puts his food to his chin before he takes a bite? That's me with laundry. I love the smell(especially since I use Unstoppables...they smell amazing) of clean clothes. When I fold, I'll pick up a pair of shorts and give her a good whiff. I feel crazy just typing this. Girl!!! It's because you use the Unstoppables! Aren't they heavenly?? 5. I could throw down an entire box of Thin Mints. I feel like Thin Mints don't really have a sweet meter. They are the perfect combination of sweet but not too sweet. I just don't get full on them. Plus they are small and easy to pop. Don't even get my started on Tagalongs. 6. I have a sick obsession with work out clothes. If you don't know this about me, I like to run. I'm studying to become a personal trainer so I just want to make sure I have the uniform down now. They are comfy, can be super cute and I just feel like they reflect my personality. I'm not down with being someone I'm not. So, I own this one. 7. I can't resist a french fry. I know your confidence in me as a trainer went way up with the Thin Mint thing. Now french fries? Yes, just yes. I think a salty, crunchy snack that can be dipped in ketchup is a win win. I don't eat them every day, or every week for that matter. But they are delicious. Plus, I love ketchup. The more the better. All that awesome artificial flavoring and high fructose corn syrup just makes me happy. Don't judge me. Kelly...we need to plan a french fry date ASAP!! 8. I crumble under pressure. I HATE the feeling. Hate it. It's ironic really. As a runner, I love to train. But this means I have to actually compete. I race and yet I dread the nerves and pressure of performing well. I've always wanted to be one of those people who "rose to the occasion" or could "thrive under pressure." I'm just not. It's something I've had to learn to let go of and deal with. Otherwise, think of all it would hold me back from. I'm currently in a season of life that is pushing me far outside my comfortable and where I'm forced to do things, in a somewhat public light, that I'm terrified to fail at. But, I know I'm doing exactly what God has told me to do. That doesn't always guarantee success. Deal with the possibility of failure, learn to handle the nerves, and go for it. Otherwise, you could miss out on some pretty amazing moments. I LOVE this one!! Great words of wisdom!! Don't forget to go check out Kelly's blog, Redhead on the Run. She blogged about "Finding My Way in a Blogging World" HERE. She blogged some other confessions HERE on her blog. I LOVED this post!! And...she blogged about "Becoming a CPT" (Certified Personal Trainer) HERE. Seriously...check her out. You'll love her! Thank you SO much, Kelly, for claiming your crazy and sharing it all with us!! To check out Shay's Owning It Post, click HERE. Woohoo! I love Kelly!! I also love how she's owning it today! Any girl that can admit to throwing down Thin Mints and fries is a girl I want to hang with ;). I love these posts!! I love this series! This was so cute. I too am a laundry sniffer - particularly my husbands tshirts. Love this post.....the shower is the best place to have a good cry! A trainer? And you can throw back a whole box of Thin Mints? And admit it on a public forum? YOU. ARE. MY. HERO. Oh my goodness....another blog I'm going to fall in love with!! Too many things in common with this fun girl...french fries, ketchup, smelling laundry! Love this Owning It series!! Aw thanks Dani!! Yes, all addicting...and all just awesome:) thanks for reading! !